Array. En fait, le livre a 176 pages. 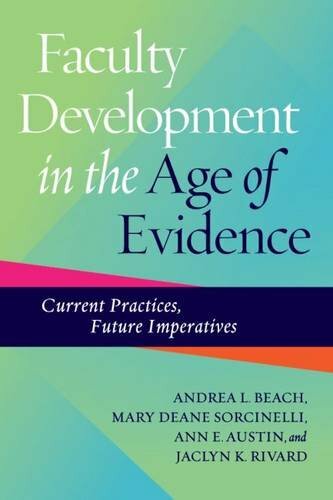 The Faculty Development in the Age of Evidence: Current Practices, Future Imperatives est libéré par la fabrication de Stylus Publishing. Vous pouvez consulter en ligne avec Faculty Development in the Age of Evidence: Current Practices, Future Imperatives étape facile. Toutefois, si vous désirez garder pour ordinateur portable, vous pouvez Faculty Development in the Age of Evidence: Current Practices, Future Imperatives sauver maintenant. The first decade of the 21st century brought major challenges to higher education, all of which have implications for and impact the future of faculty professional development. This volume provides the field with an important snapshot of faculty development structures, priorities and practices in a period of change, and uses the collective wisdom of those engaged with teaching, learning, and faculty development centers and programs to identify important new directions for practice. Building on their previous study of a decade ago, published under the title of Creating the Future of Faculty Development, the authors explore questions of professional preparation and pathways, programmatic priorities, collaboration, and assessment. Since the publication of this earlier study, the pressures on faculty development have only escalated―demands for greater accountability from regional and disciplinary accreditors, fiscal constraints, increasing diversity in types of faculty appointments, and expansion of new technologies for research and teaching. Centers have been asked to address a wider range of institutional issues and priorities based on these challenges. How have they responded and what strategies should centers be considering? These are the questions this book addresses. For this new study the authors re-surveyed faculty developers on perceived priorities for the field as well as practices and services offered. They also examined more deeply than the earlier study the organization of faculty development, including characteristics of directors; operating budgets and staffing levels of centers; and patterns of collaboration, re-organization and consolidation. In doing so they elicited information on centers’ “signature programs,” and the ways that they assess the impact of their programs on teaching and learning and other key outcomes. What emerges from the findings are what the authors term a new Age of Evidence, influenced by heightened stakeholder interest in the outcomes of undergraduate education and characterized by a focus on assessing the impact of instruction on student learning, of academic programs on student success, and of faculty development in institutional mission priorities. Faculty developers are responding to institutional needs for assessment, at the same time as they are being asked to address a wider range of institutional priorities in areas such as blended and online teaching, diversity, and the scale-up of evidence-based practices. They face the need to broaden their audiences, and address the needs of part-time, non-tenure-track, and graduate student instructors as well as of pre-tenure and post-tenure faculty. They are also feeling increased pressure to demonstrate the “return on investment” of their programs. This book describes how these faculty development and institutional needs and priorities are being addressed through linkages, collaborations, and networks across institutional units; and highlights the increasing role of faculty development professionals as organizational “change agents” at the department and institutional levels, serving as experts on the needs of faculty in larger organizational discussions.